Once a case is processed in FTK navigate to ‘Databases’ under ‘File Category’. In the file listing window sort by ‘File Type’. Any identified SQLite database files will be listed under ‘SQLite Database’. The files can then be selected and exported from the case. 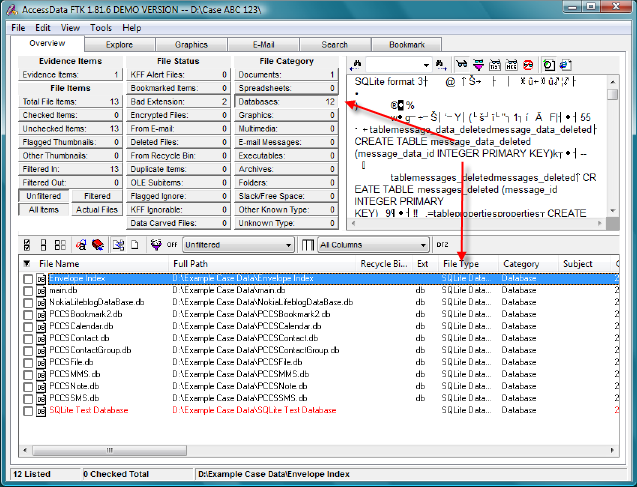 SQLite Forensic Reporter is the only tool available which uses template based SQLite DB processing. Any database that is not corrupted can be processed. Analysts and technicians will be able to quickly create new templates and decode data for themselves saving both time an processing costs. Simple Carver Suite v4.4 Released. SQLite Forensic Reporter v1.2 Released. Password and Username Identification, scans all identified SQLite database files for possible user credentials (saved as a separate listing). Software settings, SQLite databases are used to store not only general settings for software applications but you will also find user specific settings. Chat history, a number of products use SQLite databases for storing conversations between users on computer and mobile devices. Keyloggers, some key logging software use SQLite databases to store all recorded information and is well suited being capable of writing and holding millions of records containing pictures and text information. Binary (BLOB) – this can be pictures, documents or any data of designers choosing. Due to the growing number of SQLite databases present in both computer and mobile devices the time to open, process and review the data contained within each SQLite database is becoming problematic. Formats change, from time to time SQLite databases for a specific product will be updated, columns removed or added, tables renamed or removed and so on. When these changes occur it can prevent software designed to process a specific SQLite database from working correctly or produce incorrect results. Simple Calculation: Quantity of SQLite databases to analyse x Using the correct tool for each database x Time to Process each database x Review each database = A LOT OF WASTED TIME! Template processing SQLite databases is an automated method of batch processing SQLite databases for end user review. First correctly identify each SQLite Database by user configurable identification of internal and external file properties then process each table and each column in the correct matter with as little user intervention as possible. Correctly identify each database – this must be user configurable! If a new SQLite database is encountered then allow the user to identify characteristics associated with the given database. For example: File header and internal settings of SQLite database. Correctly process each table in turn and columns within each table for a particular SQLite database – this must be user configurable! If a new SQLite database is encountered or a small variation occurs in an existing database the user can create a new template to deal with this. At this stage custom queries can be devised to filter and/or present data in a similar fashion to that presented to the user as originally intended. There are infinite variations of how a table in a SQLite database can be laid out. How the data is actually stored within each column is typically only limited to a handful of data types. SQLite Forensic Reporter allows you to process virtually any SQLite database using predefined templates. SQLite Forensic Reporter is template driven and fully user configurable which means when a new SQLite database is identified a new template is created by the user. Columns are processed correctly and decoded if required using built in processing routines for date/time formats etc. The user has full control and does not need to wait for an update from the software developer. SQLite Forensic Reporter batch processes SQLite database en-masse greatly reducing the time to extract and present data from SQLite databases present in both computer and mobile devices. SQLite Forensic Reporter is $125USD per license and priced to be affordable to both individual and organisations alike. You are currently browsing the Filesig Software / Simple Carver Suite blog archives for November, 2011.